Ever since I had spotted these on a random blog (sorry, I was link happy at the time and completely forgot to take note which blog I was reading!!) sometime over the summer, I've been obsessed. Seriously. Obsessed. I can't stop thinking about them and how I want one! Actually, I would love to have a whole room filled with them. What are they? 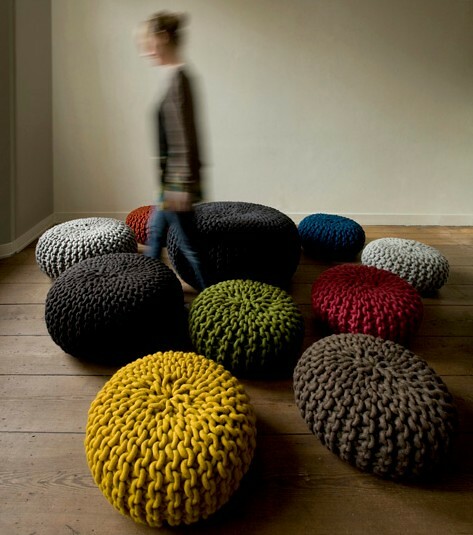 They're Urchin Poufs by Dutch designer Christien Meindertsma. 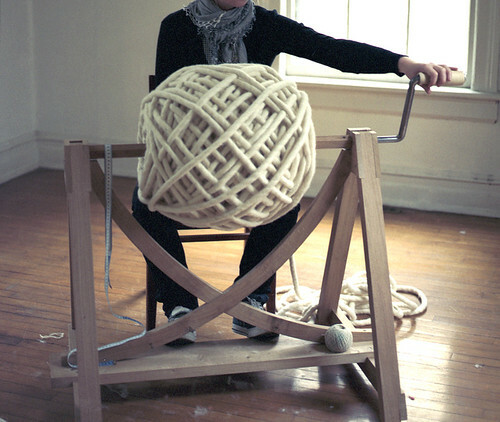 She hand knits these eco-friendly chunky poufs that takes around 6 weeks to complete. And that's per pouf! They are sooo simply gorgeous and comfy looking, don't you think? I can go on and on and on posting photos of her amazing work and process. But I won't. As much as I would love to own an original, I really can't afford to dish out €1600 for one (or €480 for the smallest version!). So I have been searching the Internets (and Ravelry!) for patterns in hopes of making one myself. It won't be the same, but maybe it'll help me get over this obsession. I've found a few promising patterns and have a few yarns in mind that I can try out. I'm dying to cast on for one pronto, but I'm promised myself that I wouldn't start any new projects until I complete a current WIP. But the wheels are turning I tell ya. Turning!! So stay tuned. There may be posts about poufs on this blog sometime in the (near) future! Those are amazing! How fun to have a whole room full, I agree! If you are up for making one, I'll be your pouf tester!!! They are so awesome! Those knitting needles are huge! If you find a pattern that works well be sure to pass it on. I have seen a knitting pattern for one of these footstool things not so long ago. I'll see if I can hunt it down for you. I'm sure I have a couple of retro patterns for them as well from the '40s/'50s. When I find some, I'll definitely pass it on. So far I only found one promising pattern. I'm going to have to read it thoroughly before i pass it along though!